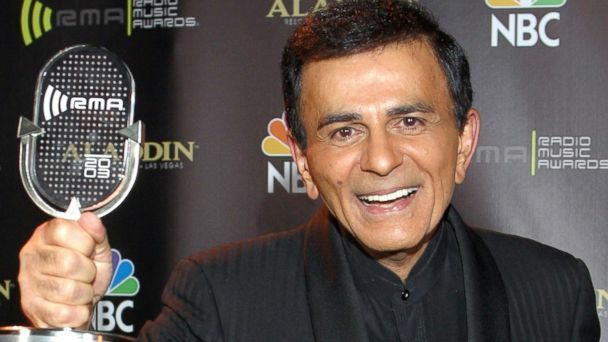 Casey Kasem is in critical condition in a Washington state hospital today where he is being treated for an infected bedsore, a hospital spokesman said. Scott Thompson, the spokesman for St. Anthony Hospital in Gig Harbor, said the ailing 82-year-old former DJ's condition was brought by ambulance to the emergency room last Sunday. The "American Top 40? host is suffering from a debilitating condition that has left him barely able to speak. Meanwhile, family members are engaged in a bitter feud for control over his medical care. Emotions boiled over last Sunday, when Jean Kasem, his wife of 34 years, threw hamburger meat at his daughter Kerri from his first marriage, just before the radio personality was taken to the hospital. The bizarre incident was the latest in a long battle. Last month, after Kasem disappeared from his care facility in Santa Monica, Calif., his children reported him missing. Authorities later tracked him down to a friend's home in Seattle where Jean told police they were on vacation. On Friday, a Washington state judge ruled that Kasem's care would be controlled by Kerri, and not her stepmother. A Los Angeles Superior Court judge ruled today that the ailing DJ should be fed, hydrated and medicated while a court-appointed attorney meets with him and his doctors in order to evaluate his health. The judge also kept Kasem's daughter temporarily in charge of medical decisions involving her father. In a statement last Friday, Kerri's spokesman said her father's health is declining and he "won't be with us much longer."